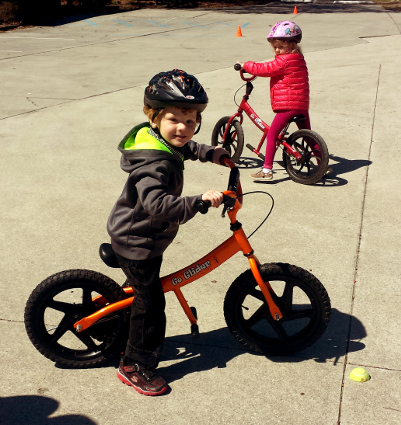 News :: Learning to Bike in the Wind - Glide Bikes - Balance Bikes for 18 months to 10 years old! Glide Bikes had another successful day with Kim’s Gym last week. It was rather windy and chilly, check out those coats! But the cold didn’t dampen anyone’s spirits. Instead, kids made great progress on balancing, with one rider getting his first taste of balancing alone on his two wheel pedal bike! We set up a course that encouraged a little balancing momentum by utilizing a gentle slope in a roped off portion of the parking lot. The slight drop in the pavement allowed kids to lift their legs and still gain speed, practicing their balancing skills. Although the weather was not being very supportive of our efforts to offer some outside fun, the kids still had a blast and it resulted in an exciting moment when one of our riders took off on his own two wheels for the first time, with some assistance from Mr. Mike, of course. 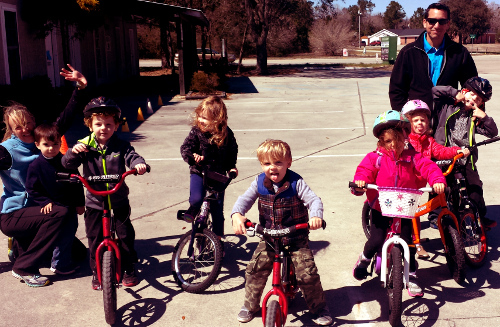 Between the hands on learning demonstrations and the freedom to experiment with balancing on bikes built to encourage growth, the kids had a fun, productive time. They were able to enjoy the outdoors, and get more acquainted with the challenges of balancing on two wheels. 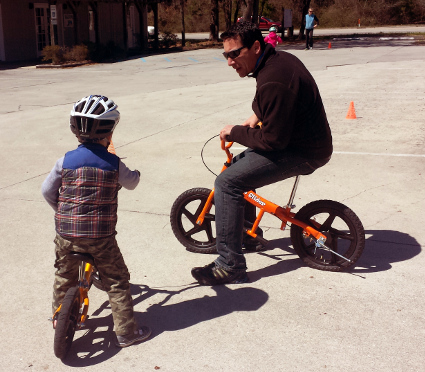 Here is Mr. Mike demonstrating how to ride a Glide Bike to one of our new glider riders!